99 cent and dollar frozen packages of fish are perfect for single servings of this most expensive Mexican restaurant seafood entree. Traditionally made with red snapper, any firm fish will do. The other ingredients are the dollar store staples of green olives, and diced, crushed or whole canned tomatoes. A pinch of dried oregano and a bay leaf complete the flavorful seafood Latin dish. It is all about the sauce. I've had Red Snapper Veracruz at many local Mexican restaurants in L.A. -- well a small taste, that is, this being my wife's favorite (she usually gives me a couple of spoonfuls). I like the complex combination of sour, salty green olives and the citrus, sweet tomato, sharing the plate with a flaky fish fillet. I've bought 4 oz. frozen packet of mahi mahi, tilapia, tuna and salmon at 99c Only Stores, and $1 packages of the same in the frozen cases of regular chain grocery stores. Now that comes out to $4 per pound, not the best deal but fine for a single serving -- when I buy fish I always get huge fillets, too much for a serving, so this forces me to cut down. Four ounces is enough. It is a quick, easy and delicious dish. The version I made used chopped whole tomatoes that were on the verge of turning - too soft for a salad, but great for a sauce. I had to add a 1/4 cup of liquid - but you can use canned tomatoes, it will taste the same, plus it will be plenty saucy. 4 oz. fish fillet - any firm fish including: mahi mahi, tuna, salmon, swordfish and tilapia. 1 small can of tomato - chopped, crushed or whole (whole are easy to break apart once heated through). Okay to use one large fresh tomato - will need to add 1/4 cup of water, stock or white wine. 1/2 jar of green olives (about 12 whole) - drained, with or without pimento. Roughly chopped. 1 tablespoon of lemon juice from bottle or fresh - optional. 1 tsp. chopped garlic from jar or fresh. Pinch of oregano and one bay leaf. A little chopped jalapeño for some heat - optional. Add 1 tbsp. of oil to a pan and brown one side of fish over medium/high heat (if fish has skin, brown on that side). Don't cook all the way through, you will finish steaming it in the sauce. Set aside. 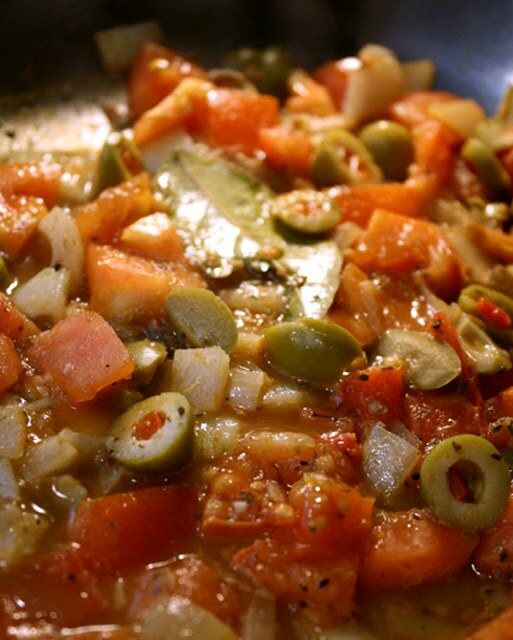 In the same pan add chopped tomato (fresh or canned) with liquid. Add green olives, lemon juice, oregano and a bay leaf. Scrape bottom of pan to get flavorful brown bits mixed into sauce. 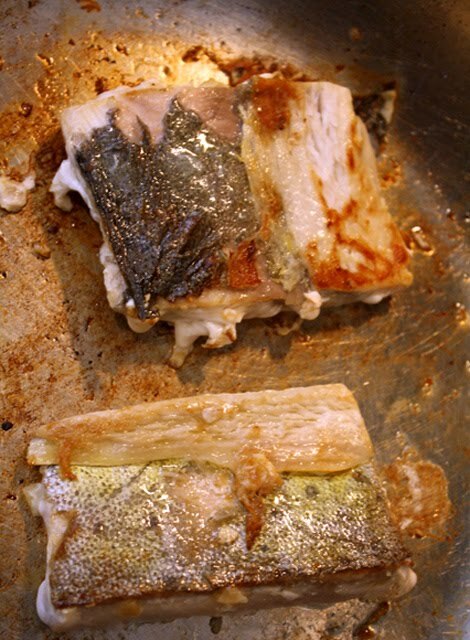 Place fish fillets on top of sauce, browned side up. Cook over low/medium heat about 10 minutes, or until liquid is reduced by half. Add stock or white wine if using fresh chopped tomato. Rice is an excellent accompaniment to soak-up the Veracruz sauce. You've done it again chef. The combination of salty olives with mild fish is very appealing. Will be trying this soon. This is another nice recipe for us! 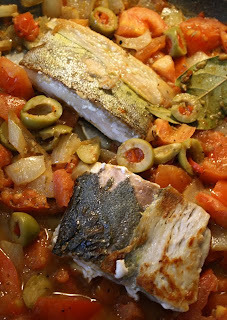 The combination of salty olives with mild fish is very appealing.